Preheat the oven to 350° and spray a 9×13″ glass baking dish with spray. Combine the cranberries and orange juice in a small glass mixing bowl, put in the microwave for 30 seconds on high, let sit on the counter. Whisk the flax-seed meal and water together in a small bowl, set aside. Stir the dry ingredients (flour through salt) in a medium mixing bowl, set aside. In a stand mixer beat the buttery stick until light, add in the sugar and beat to combine. Add in the flax-seed mixture and beat in. With the mixer on low add in the dry ingredients, beat in and then add the cranberries and orange juice, then the chocolate chips and pecans. Knock out the batter into the prepared pan, smooth out. Bake for 25 to 40 minutes, checking every 5 minutes after 25, until it is golden brown, the top is set and a toothpick comes out clean. Let cool on the counter and then store in the refrigerator. 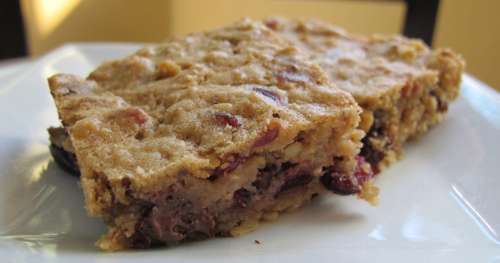 You had me at the ingredient list…OJ, Cranberries, Pecans & Chocolate chips – delish!